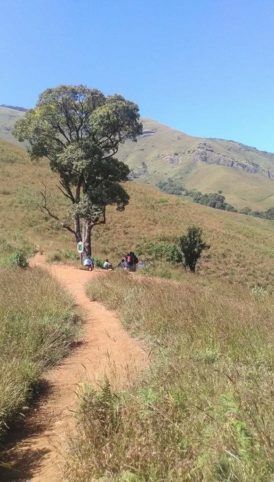 This is the story of my trek to Kudremukh Peak, which commenced on December 17, 2017. 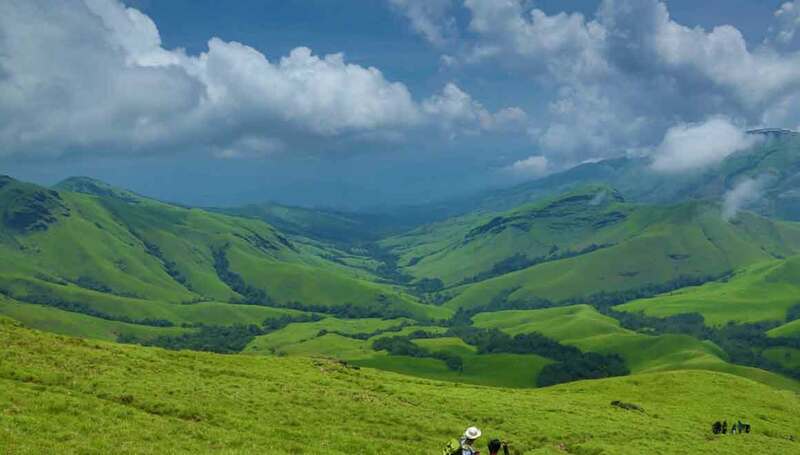 Kudremukh is located in the bordering area of the Western Ghats covering three districts in Karnataka namely Chikkamagalur, Dakshina Kannada, and Udupi. 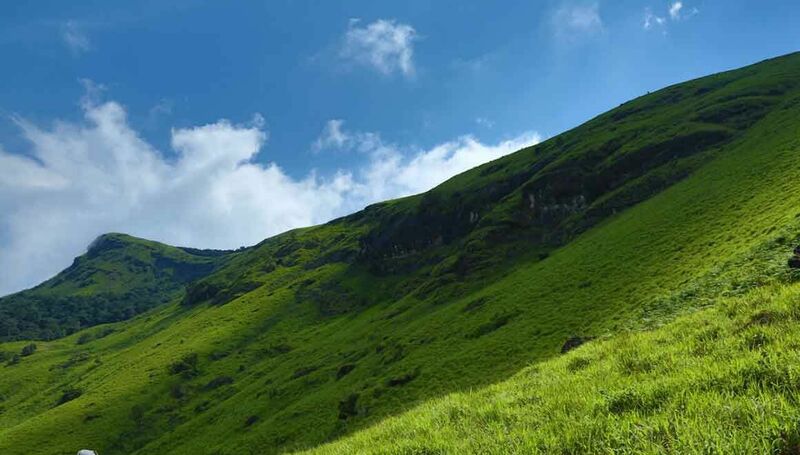 An ultimate place for nature lovers and trekkers. At a height of 1894m from sea level, this trail is a moderate to difficult one. 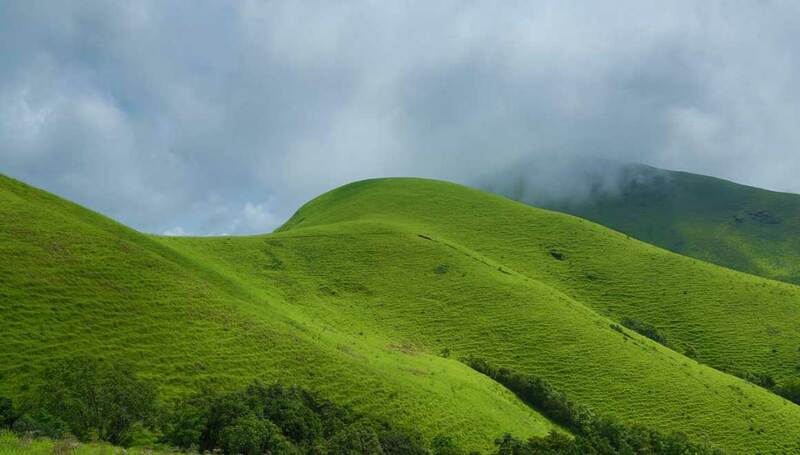 Kudremukh Peak is the third highest peak after Mullayanagiri and Bababudangiri. 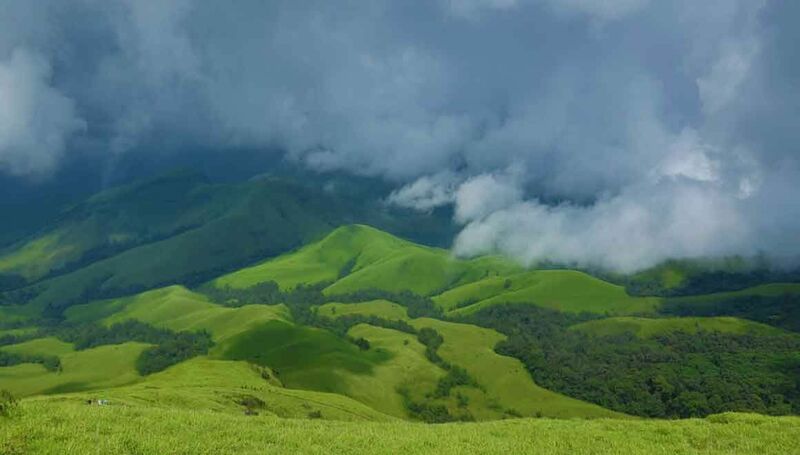 With Natural grasslands and very dense Shola forests, it makes the greenery of these undulating hills eye-catching and memorable. 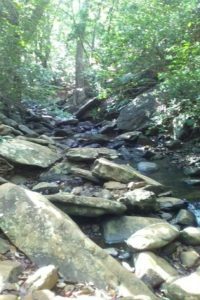 I am writing this to share my trekking experience and also to show how the peak looks in December and how the climb is expected to be. 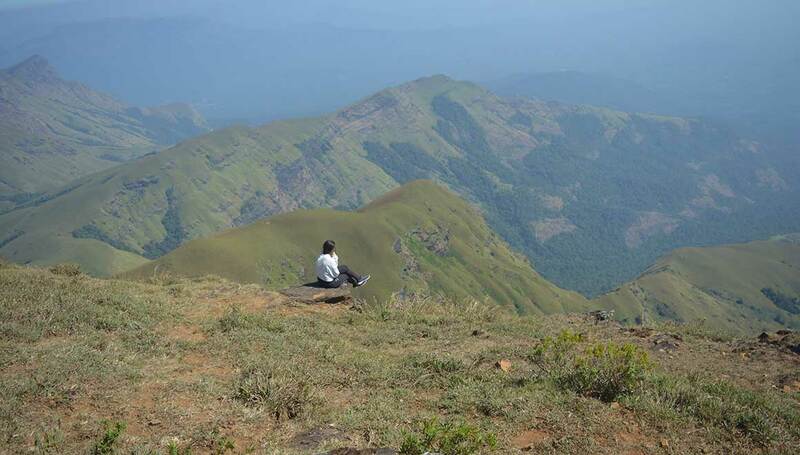 I had the information that trekking Kudremukh Peak is best from October to February. No doubt it was true, but I don’t think it is the same now. Because with the less rainfall, short winter, comes the dry season. As a result, the mountains are no more green and it is mostly dry everywhere. You can Compare the photos of our same trek in October and in December, there is a huge difference. And if this continues, I think it will be more difficult for us to trek in February as it might start getting very hot during January. The best time to trek this place is in October and November. Soon after the rainy season, this place is heavenly. So I would like to suggest that you should plan your trek in the month of October or November. Without further adieu, let me tell you about the memories we created on this trek. It was 5.00a.m. in the early morning and we started from Mangalore, with 13 people on board, all college students except me. 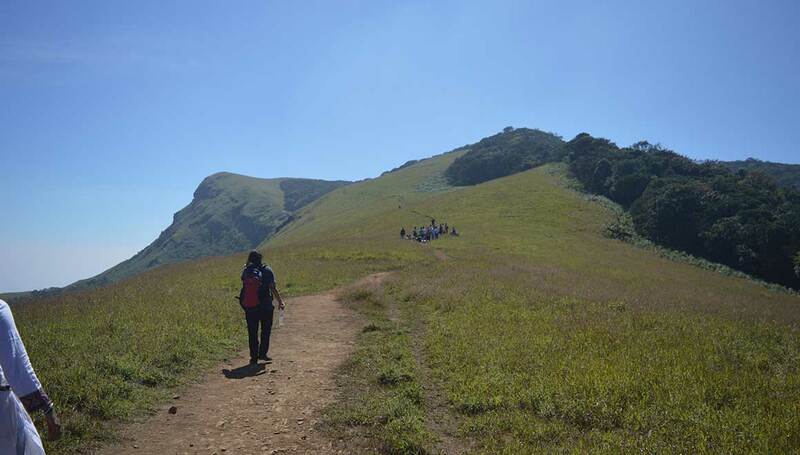 Everybody was so enthusiastic about the trek and most of them were trekking for the first time. After 3hrs. 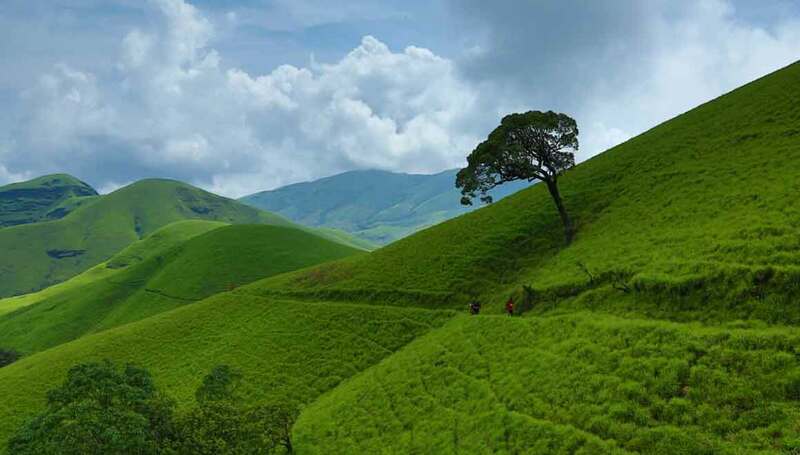 of the journey from Mangalore and a small nap with some road bumps, we reached a village called Balegal in Kudremukh. Balegal is just after the Kudremukh Iron ore mine which is now closed down. 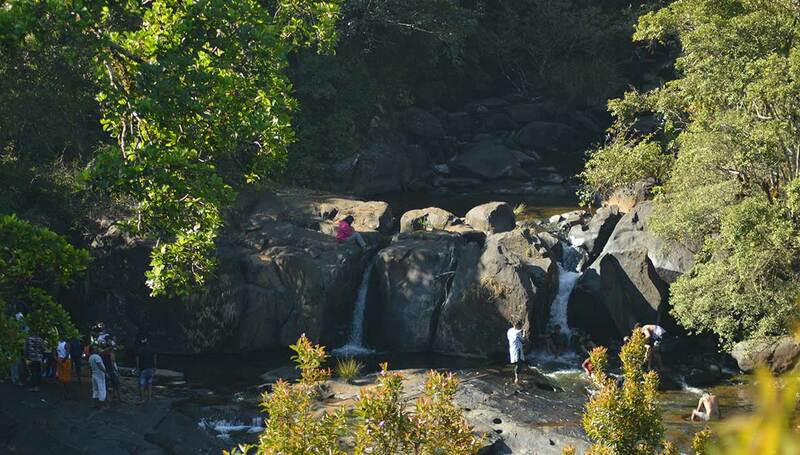 From Balekal, we had to take a jeep drive and reach Mullodi, the starting point of our trek. In October it was very chilled, but it was not so cold this time in December. We could already see the difference in weather. After driving 6kms upwards the hill we reached the trek starting point. 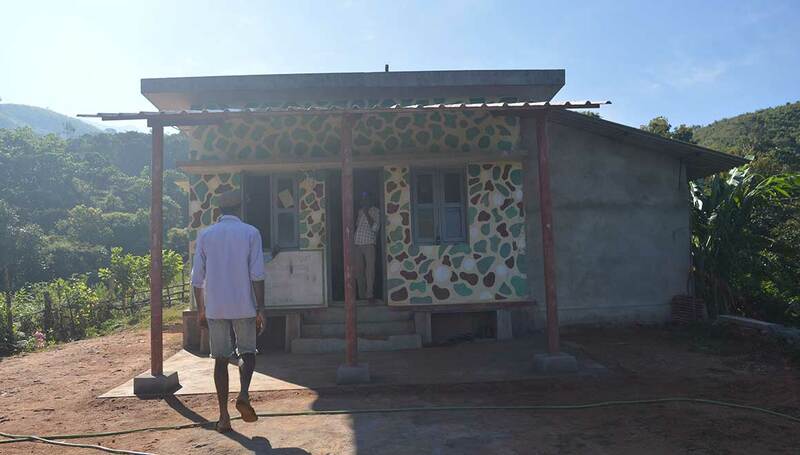 There is a homestay nearby, which you have to pre-book if you want to stay at night. But from Mangalore it’s not so far, so one need not stay overnight. We had hot veg pulao and hot tea for our breakfast. Sometimes they serve hot and soft idli with sambar which is the favorite breakfast in Karnataka. After breakfast, We left our excess luggage in the homestay, so that we could climb easily with less weight. We carried some packed lunch called Puliyogare, which is made of rice and is a healthy food and best for trekking. 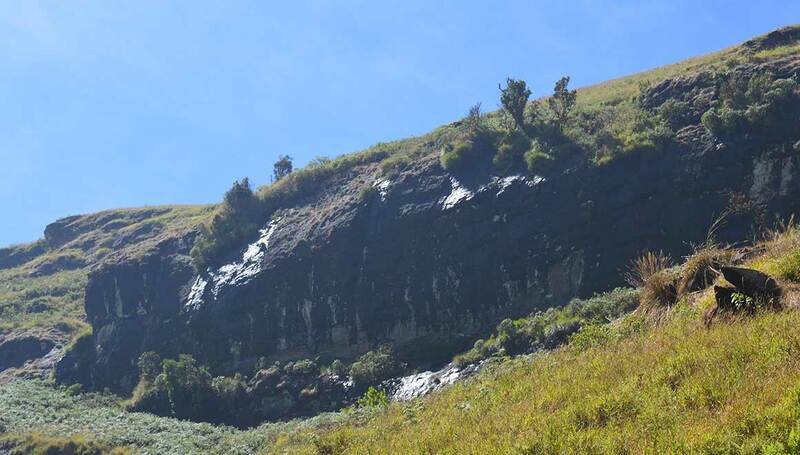 Just as we crossed the homestay we could hear the sound of a small waterfall which was roaring in October. But was very silent at this time. We planned to get wet after we are back from our trek. Hence we continued to the Forest office. We have to inform Forest office about our trek, pay the trek and the guide fees in the office. 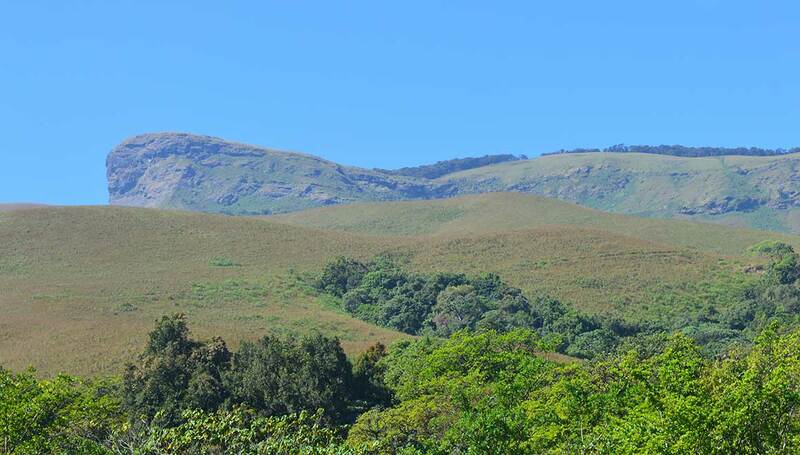 Kudremukh Forest is a reserved forest area, hence we have to take permission before we start trekking. Entering without permission is a punishable offense and strictly prohibited. Also, We were instructed to be back by 6.00pm by the forest officers. We would be fined if we did not reach by then. It is compulsory to take a trek guide and only local people can be the guide. During the trekking season, the local people get the opportunity to earn some extra money as working as trek guide. 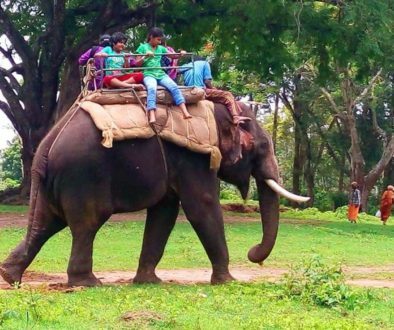 In the off trekking season, they are busy with their agriculture, mainly with paddy, rubber and coffee plantations. Usually, with a decent speed and proper rest, it takes 5hrs to reach the peak. 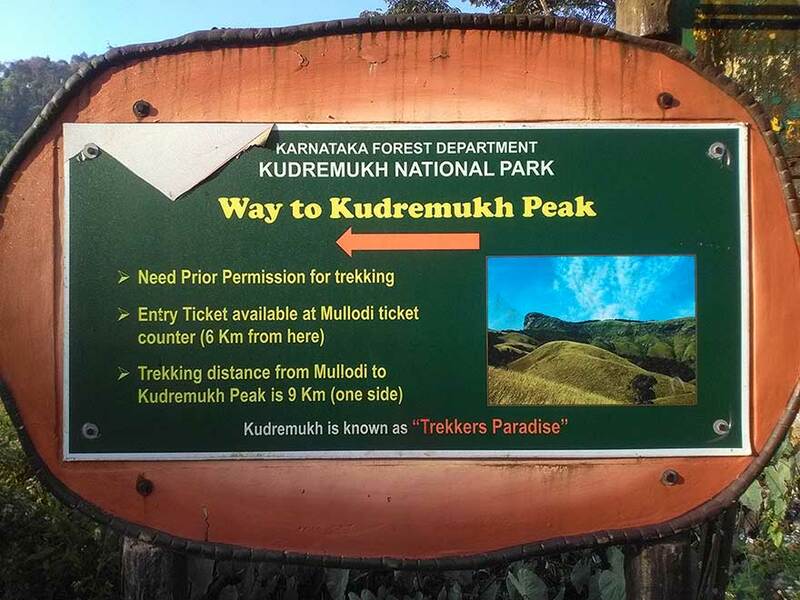 It’s written as 9kms as trek length in the signage, but it’s actually more. It’s around 10.5kms. By 9.00am we started to trek and our plan was to reach the peak by 2.00pm. The trekking path was so different compared to the one in October. In October it was completely green and the path was hardly visible. But this time it’s easy to find the trekking path. This time when we trekked the path was so wide and very clear because the grass had started drying. As we walked for 1 Km, we could see the first view of the peak which still was 8kms away. 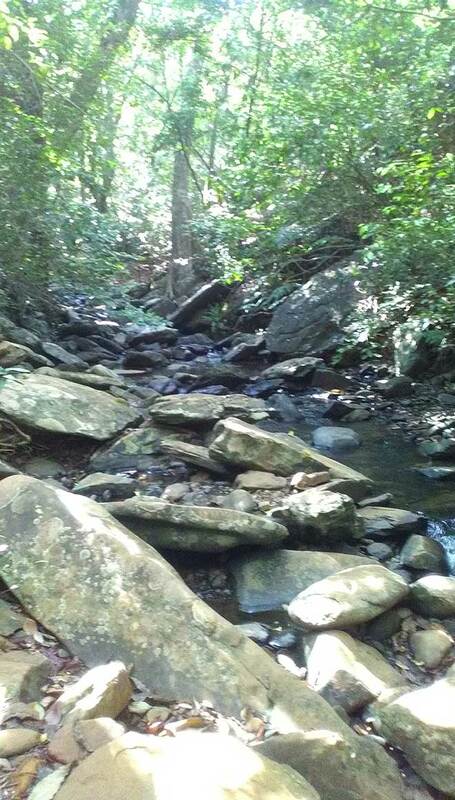 We had to cross 3 to 4 streams in our trekking path. Since the water was scanty, it was easy to cross. But I remember when we crossed these streams in October, it was so joyful, we were fully wet and were shivering too. I hope there will be water for the trekkers who will trek in January or February. The path was so muddy, wet and slippery during October. But this time it was too dry and slippery. Thankfully there was cold breeze throughout the day. By this time our breakfast was fully digested and we also wanted a break and shade to relax. It was almost halfway up & our guide said that just little bit ahead, there is a nice place to take a break under a tree with a seating made up of stones. We can take a break as well as view magnificent mountain view from this place. Even the sky was so clear. It was around 10.30am. We ate some fruits, rested and took a break and then started again. We could see the peak bit closer from there. 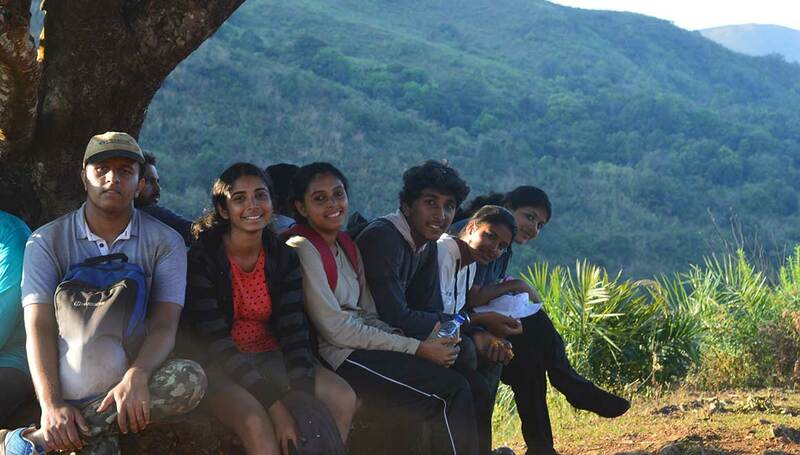 All the first time trekkers were so happy. But others knew what came ahead. After a small curve and a stream, we had to pass through the Forest. It was so nice because it was so dense and fully shaded. After this forest came the actual hard part of the trek, climbing the hill which is very steep. It is almost 60 degrees. And this is the toughest part of this trek. Everybody with great difficulty climbed up. By now all of us were tired again and exhausted after the steep climb. But it was so worth climbing this steep hill and view the mountains from the height. A small break was the most important thing now. And there we saw a lonely tree called as ‘Ontimara’. The tree was covered with beautiful green leaves when we last visited. Compare the pics. We took rest for some time under the tree and started again. 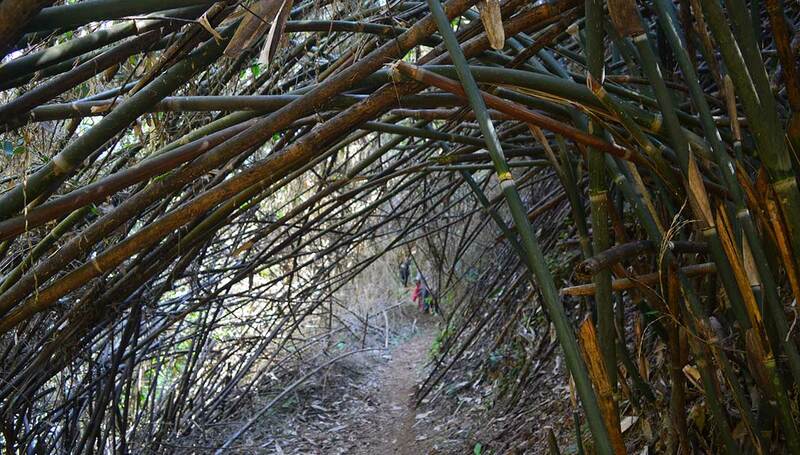 Just after this, there was a beautiful arch made up of bamboo welcoming us though it was a bit dry than earlier. The peak is closer now. And just after this, comes the second steep climb. Many of us broke down. But others encouraged them and it was just roughly 500mts after this steep climb to reach the peak. Everybody started climbing except two stopped there and went back. After this second steep climb, the peak was too close, just 500mts away and that too it was a level surface to walk. All of us were finally content to reach the peak. We felt we achieved something. It was just 1.00 pm. We had reached 1hr prior to our estimated time. We enjoyed the magnificent view from the top of the peak. We were taking photos, discussing the hardship we crossed, the struggle, the pain. 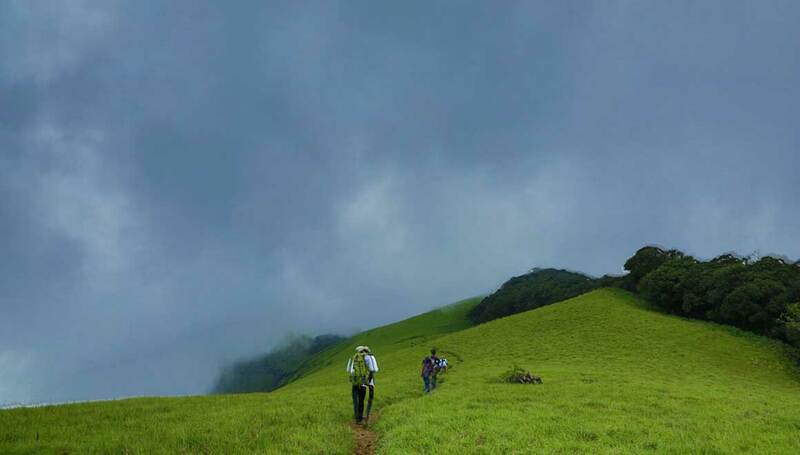 But finally, we achieved our target and reached the destination – The Kudremukh Peak. We took a long break, almost an hour. We stepped down to a level surface where there is a small stream flowing and decided to have our packed lunch. It was 2.30 pm. After having our delicious lunch, we started descending. The same steep hill we had to cross again, but since we took good rest for some time it was little easier. We were very careful and were climbing down much faster. Our knees were very badly hurt, we could feel it when we were climbing down. We took two small breaks under those two trees. The guide with us was a blessing. He was continuously instructing and guiding us so that we reach before 6 pm. It was easy to climb down compared to climbing up. By 5.30 pm everybody reached the base, took a nap, relaxed. As our legs were paining sorely, we dropped the plan to visit the waterfall nearby. A body massage would be a therapy at that moment. But to our dismay, there was no such facility available. After freshening up and having a cup of coffee, we boarded our vehicle and started driving towards Mangalore. We reached Mangalore by 9:30 pm. Undoubtedly the climb was difficult for the first-timers. But it was worth it. 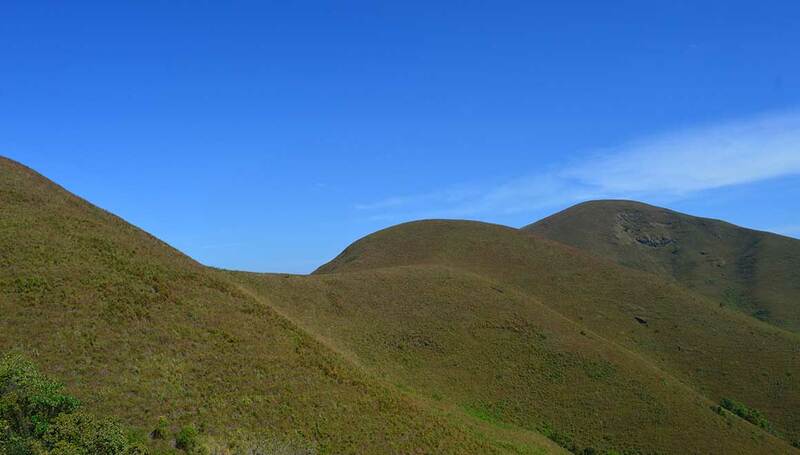 If you are planning to trek this peak, then do trek either in October or November because it is not so convenient after that. It’s mostly dry after that. Also, try and avoid rainy season because there will be lots of leeches and it will be too slippery and risky. 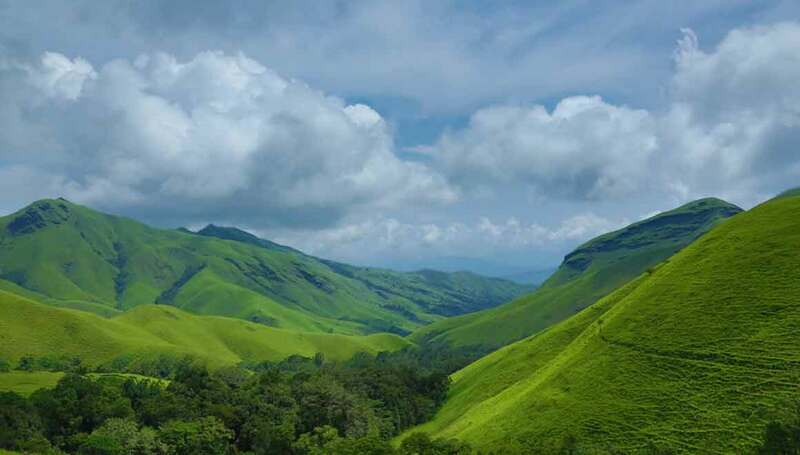 We Tourhythmindia arrange such treks from Mangalore. 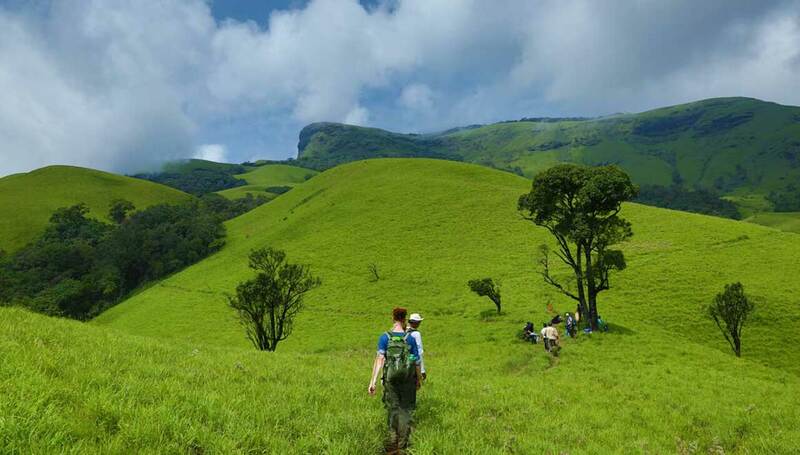 If you are interested trekking with us, then feel free to contact us.